Christine is band leader of Christine and the Stackyard Stompers. 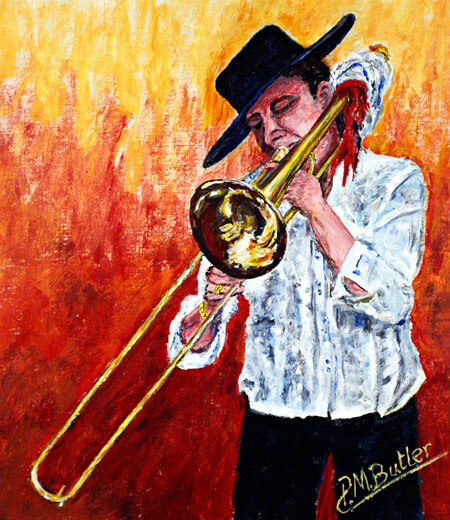 In this jazz painting commissioned by Christine I have captured her on trombone at a 2011 Peartree Monday Jazz Club gig in Welwyn Garden City. But I admit to a modicum of artistic licence in the backdrop. 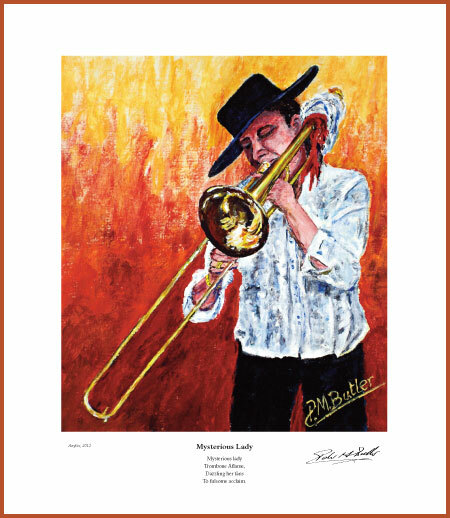 Below is my fine art print of the jazz portrait of Christine along with my poem which conjures up the aura of mystery with which she surrounds herself. Or perhaps that’s just my imagination. The lady prefers to be know to her fans simply as Christine, band leader of Christine and the Stackyard Stompers. Hence her aura of mystery. My portrait captures her on trombone in typically flamboyant style at a Peartree Monday Jazz Club gig in Welwyn Garden City, with a little artistic licence to highlight her stunning performance. Art & Verse’ Copyright © 2012 Peter M Butler. All rights reserved.